Lighting has moved on in recent years with the development of affordable LED technology. The incandescent light bulb is fast becoming obsolete and is gradually being replaced with LED lighting that has a much longer life. Other benefits include cost savings, improved quality of light and the technology is environmentally friendly. LEDs have an exceptionally long life with up to 50,000 hours of useful life compared to other types of lighting which have much shorter lifetimes, for example; fluorescent tubes typically have around 10,000 to 15,000 hours and halogen lamps 1,000 to 2,000 hours. 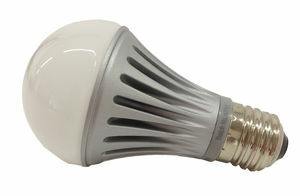 LEDs also produce more lumens per Watt than halogen lamps and give a better, brighter quality of light. Quality generally refers to the consistence of colour in the beam of light and correlated colour temperature. Energy cost savings of up to 70% per annum can be achieved by using LED lighting products compared to halogen. With energy costs continuing to rise, using energy efficient LED products will help towards reducing utility bills. Other forms of lighting contain mercury components or emit chlorofluorocarbons (CFCs). LED technology does not, making it much more environmentally friendly. Because LEDs are solid state components, they are more robust and less likely to damage due to impact or vibration than other forms of lighting. Frequent on – off switching is not detrimental to LEDs, unlike traditional lighting which can burn out more quickly with regular switching. LEDs do not produce ultraviolet or infrared radiation and therefore do not radiate heat in the direction of the object being illuminated. Heat build up from lighting can trigger a need for air conditioning or cooling fans which increase energy costs. This reduction in discharged heat makes LEDs ideal for illuminating materials that can deteriorate under lighting such as food and works of art, etc. The latest LED products are now suitable for all types of light fittings and can be used to replace traditional halogen and incandescent light bulbs. They can be used in domestic or commercial applications and for a variety of indoor or outdoor uses. Save money, save the environment and enjoy a better quality of light for domestic and commercial applications by changing to LED lighting. Because we buy in bulk direct from our distributors we can save you money on your whole house conversion to LED lighting.